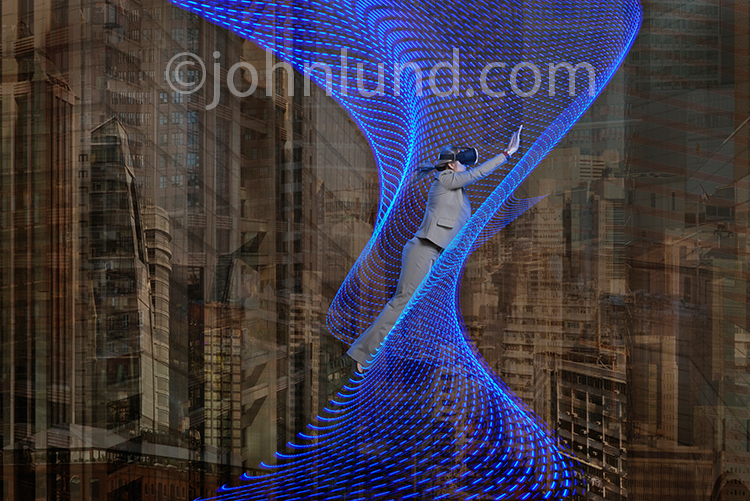 Virtual reality in business is the concept in this stock photo of a woman rising up a vortex of light trails while wearing VR headgear. I recently read how NFL teams are using VR (virtual reality) to train their players. It triggered a thought in me…there are so many applications for VR in the business world (and I count the NFL as a business) that now is the time to create some Virtual Reality stock photos aimed at a business audience. I picked up a pair of VR goggles at a local thrift store for $3.95. The next time I hired some models I included my VR ideas in the shoot. I wanted to create an image that could symbolize the ability of Virtual Reality to offer training, business opportunities and, in essence, a new freedom. I photographed the model wearing the headgear and jumping with her arms upraised to give the impression of flight. It was my belief that by having the model flying it would add drama and emphasize the revolutionary aspects of virtual reality. For a background I chose an abstract composite of various cities (including Hong Kong, Buenos Aires, New York and San Francisco). By having a backdrop of a metropolitan environment I felt the business aspect of the image would be emphasized. By adding a colorful light trail image I could add some eye appeal and further the futuristic aspect of the image. I used blue light trails, captured with a long exposure of city lights at night, because blue is the color of business. I manipulated the light trail image to take on an artistic spiral, a conduit to new opportunities, and within which the model is flying. The image is composed to facilitate easy cropping to any format, and the background is dark enough to reverse out headlines and type. The image speaks of Virtual Reality, possibilities, holograms, success, freedom and the future…and probably a few more too…never underestimate how a fellow creative might use your images! What is the actual truth behind Virtual Reality Business? I have to write for Essay Writing Companies on Virtual Reality world.